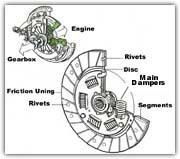 A Clutch is a mechanism for transmitting rotation, which can be engaged and disengaged. Clutches are useful in devices that have two rotating shafts. In these devices, one of the shafts is typically driven by a motor or pulley, and the other shaft drives another device. In a drill, for instance, one shaft is driven by a motor and the other drives a drill chuck. 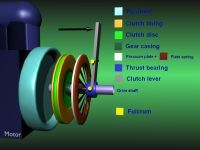 The clutch connects the two shafts so that they can either be locked together and spin at the same speed, or be decoupled and spin at different speeds. There are many different vehicle clutch designs but most are based on one or more friction discs, pressed tightly together or against a flywheel using springs The friction material varies in composition depending on whether the clutch is dry or wet, and on other considerations. Friction discs once contained asbestos, but this has been largely eliminated. Clutches found in heavy duty applications such as trucks and competition cars use ceramic clutches that have a greatly increased friction coefficient, however these have a "grabby" action and are unsuitable for general road use. 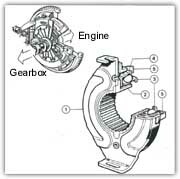 The spring pressure is released when the clutch pedal is depressed thus either pushing or pulling the diaphragm of the pressure plate, depending on type, and the friction plate is released and allowed to rotate freely. When engaging the clutch, the engine speed may need to be increased from idle, using the manual throttle, so that the engine does not stall (although in most cars, especially diesels, there is enough power at idling speed that the car can move. This requires fine control of the clutch). However, raising the engine speed too high while engaging the clutch will cause excessive clutch plate wear. Engaging the clutch abruptly when the engine is turning at high speed causes a harsh, jerky start. This kind of start is desired in drag racing and other competitions, however. In a car the clutch is operated by the left-most pedal using hydraulics or a cable connection from the pedal to the clutch mechanism. Even though the clutch may physically be located very close to the pedal, such remote means of actuation are necessary to eliminate the effect of slight engine movement, engine mountings being flexible by design. With a rigid mechanical linkage, smooth engagement would be near-impossible, because engine movement inevitably occurs as the drive is "taken up". No pressure on the pedal means that the clutch plates are engaged (driving), while depressing the pedal disengages the clutch plates, allowing the driver to shift gears or coast. A manual transmission contains cogs for selecting gears. These cogs have matching teeth, called dog teeth, which means that the rotation speeds of the two parts have to match for engagement. This speed matching is achieved by a secondary clutch called a synchronizer, a device that uses frictional contact to bring the two parts to the same speed, and a locking mechanism called a blocker ring to prevent engagement of the teeth (full movement of the shift lever into gear) until the speeds are synchronized. The most common problem with clutches is that the friction material on the disc wears out. The friction material on a clutch disc is very similar to the friction material on the pads of a disc brake, or the shoes of a drum brake , after a while, it wears away. When most or all of the friction material is gone, the clutch will start to slip, and eventually it won't transmit any power from the engine to the wheels. The clutch only wears while the clutch disc and the flywheel are spinning at different speeds. When they are locked together, the friction material is held tightly against the flywheel, and they spin in sync. It is only when the clutch disc is slipping against the flywheel that wearing occurs. So if you are the type of driver who slips the clutch a lot, you will wear out your clutch a lot faster. Another problem sometimes associated with clutches is a worn thrust bearing. This problem is often characterized by a rumbling noise whenever the clutch engages. Excessive riding on the clutch will wear out the thrust bearing prematurely.There must be free play between the diaphram of the clutch and the thrust bearing . Failure to allow for this will cause the thrust bearing to constantly engage , and will fail in a very short period of time. The clutch cover is the component that engages and disengages the driven plate. Locate the dowel pins correctly when fitting the clutch cover. The flywheel must be skimmed. The pressure plate and flywheel must be washed clean of any oil deposits. Tighten the fixing bolts gradually and in a diagonal sequence. Never fit a clutch cover that has been dropped. Carefully guide the gearbox when fitting. Refer to the manufactures specification to ensure correct clutch adjustments. Since 1991 all the Valeo friction linings are asbestos free. This new material is essentially made of glass fibre and provides excellent physical and mechanical qualities. Check that the new driven plate slides freely on the gearbox shaft. Check that the new driven plate is fitted the correct way round. Take care not to bend the plate when refitting the gearbox. The release bearing transmits the movement of the fork to compress the diaphragm. Guide sleeve 2 made of (polyamide 6.6.) It has splines to control any misalignment of the clutch fork fingers. Roller bearing: the internal collar 3 is in contact with the diaphragm fingers. The external bearing carrier 4 is held on the sleeve by the retaining spring 5. 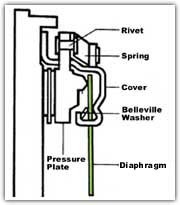 Push type: press down on the diaphragm fingers to release the pressure of the spring this is the most common type. Pull type: This is of the self centering and pre loaded type. Pulls on the diaphragm fingers to release the pressure on the springs. Can be fixed to the diaphragm or clipable/removable during assembly. Self centering: the bearing floats on the sleeve so that the bearing can move to line up with the clutch cover and diaphragm fingers resulting in greater smoothness during operation and greater life. Pedal is hard to depress - bearing may have worn the tips of the diaphragm fingers resulting in too low preload. Stiffness at point - damage to sleeve of bearing or travel, gears - bearing guide is worn fork guide is worn or bent. Noisy clutch and pedal - locating lug on bearing can be slack, worn or broken. The pro’s of performance clutches ? A performance clutch transfers more torque than its stock equivalent. A well designed performance clutch will engage decisively under extreme conditions. It will withstand abrupt, high RPM engagement. The con’s of performance clutches ? Performance clutches don't make your car go faster (except in certain rare applications). They do not last as long as stock clutches (there are a few exceptions). They cost a lot more than a std clutch. Figure out what level of upgrade you need. Remember that stock clutches will generally handle torque up to 15% of the original vehicle configuration. If your vehicle is nearly stock and you drive even halfway reasonably, you may be better off with a stock clutch. If you have added a super charger or other accessories that increase torque output by more than 15%, or if you are prone to extreme engagement (side-stepping the clutch under acceleration) then you need to find the appropriate clutch for your situation. Whatever you choose, be aware that there are always trade-offs to any custom installation. Pedal feel may be harder. Engagement may be rough, abrupt and noisy.. AS WITH ALL PERFORMANCE PRODUCTS FOR MODIFIED VEHICLES INCLUDING CERAMOMETTALIC , BRONZE BUTTON , SINTERED METAL FRICTION MATERIAL ,THESE ARE NOT COVERED BY ANY WARRANTY.